Home What is שָׁלוֹם (shalom)? Completeness, wholeness, health, peace, welfare, safety, soundness, tranquility, prosperity, perfectness, fullness, rest, harmony, the absence of agitation or discord. This is what Jesus gave us! His shalom, as recorded in John 14:27. From Hebrew to Greek to English, the meaning loses some of its “umph!” for sure. εἰρήνην ἀφίημι ὑμῖν, εἰρήνην τὴν ἐμὴν δίδωμι ὑμῖν· οὐ καθὼς ὁ κόσμος δίδωσιν ἐγὼ δίδωμι ὑμῖν. μὴ ταρασσέσθω ὑμῶν ἡ καρδία μηδὲ δειλιάτω. But, what about Aramaic? Didn’t Jesus speak that language instead? The jury’s still out. No definitive proof presently exists that tells us what language He actually spoke. However, if it was Aramaic and not Hebrew, then He would have said the word “shlama.” Which also means peace. 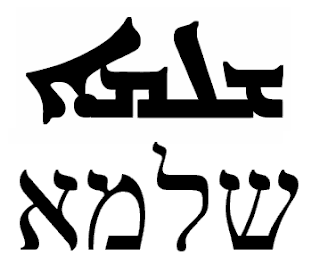 Either way, whether in Hebrew or the similar Aramaic…Our Lord Jesus gave us His complete peace.